I still remember the day when I saw the first episode of the TV show Game of Thrones: I was quite intrigued by it. When the dude’s head got chopped off in the first season, I knew what I had to do: stop watching the show and start reading the books. I was quite intrigued by the story. In my experience books are often better than movies. I am not a heavy reader, but I finished the fourth book and am still trying to get through the fifth one. Throughout the first couple of seasons, the show was quite faithful to the books and it only started to deviate from them in the course of the recent seasons. Thanks to my background reading, I know the story quite well. 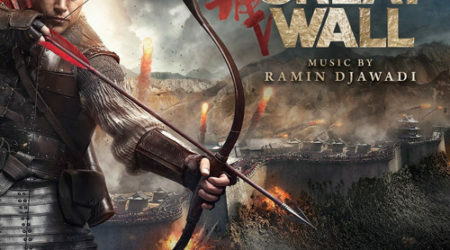 But what I know even better is the show’s music, written by Ramin Djawadi. I have listened to the scores multiple times. Currently, the soundtracks of six seasons have been released and each one has some real gems. 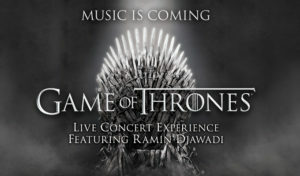 When they announced a tour of Game of Thrones concerts featuring Ramin himself, I was quite happy. Since visiting New York was still on my bucket list and my friend was willing to join, we set off for some sight-seeing in the Big Apple with the Game of Thrones Live Experience as the main attraction. Before I start this report, I need to give a little disclaimer. There is a lot of music written for the show and the concert did not include a program. I tried to write it all down, but some pieces were missing, or the order would be wrong. I tried to note the track name for each piece, but my knowledge was not good enough to recognize each theme. If you attended the concert and spot a mistake, just let me know in the comments. 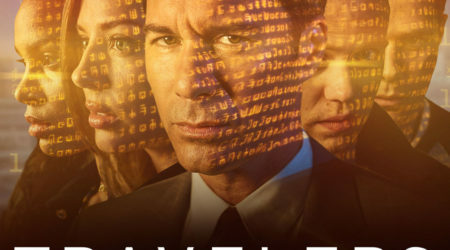 The following text also includes many names, words and other items that are used in the show, so unfortunately, that may be a little confusing if you are not familiar with the TV show or the books. When we walked into the magnificent Madison Square Garden, we could already see that we were in for a treat. From our seats, we looked down on a very beautiful stage. 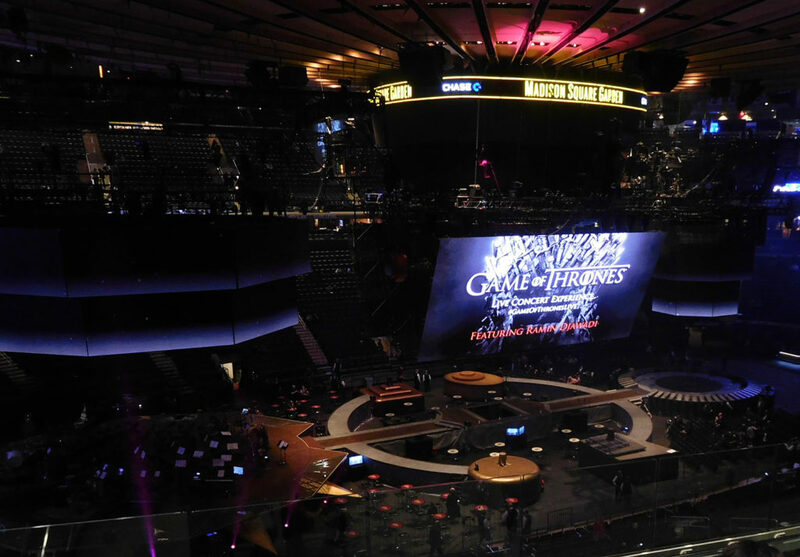 To the left was a round platform where the orchestra and choir were sitting, with screens above them showing Game of Thrones images. In the middle were four small platforms in each corner and a bigger one in the middle for the artists to stand on. Above them, there were two huge screens hanging back to back and tilted a bit towards the ground. And lastly, to the right, there was a small circle with screens mounted above it as well. This platform was also meant to be a stage for small performances. Every platform was connected with pathways for the artists to walk on. On the screens a clock was counting down the time until the start of the show. When the countdown reached zero, Djawadi himself conducted the orchestra to play the “Main Theme”. The start was barely audible because of all the cheering coming from the audience. 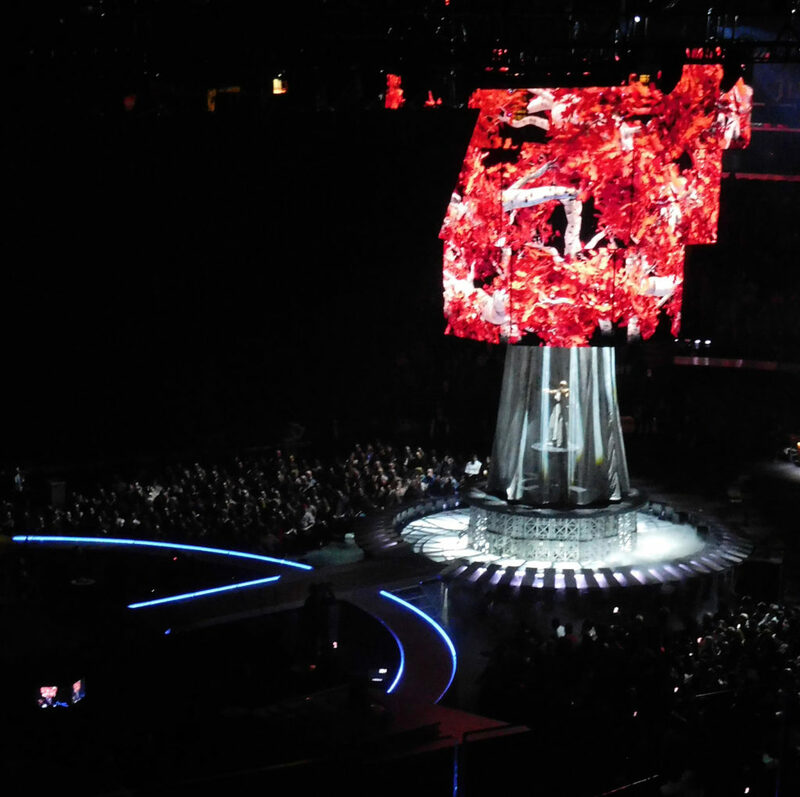 When the Iron Throne appeared in the middle of the stage, the cheers were even louder. After the “Main Title”, Djawadi grabbed the microphone and greeted the audience. He had a little surprise for us: Isaac Hempstead Wright, who plays Bran on the show, then briefly joined him on stage. Djawadi also told the audience that he was very glad to be in New York. He could not believe he would be performing in one of the most famous venues in the United States. 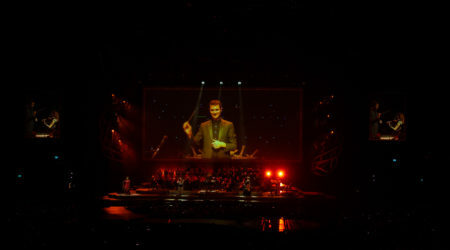 He wanted to start the evening with images of the show we all loved, so he started a medley of the themes of all the families in the show, while the actors appeared on the screens. The rest of the program followed the show’s chronology pretty closely. Thus it started with music from the first season with a characteristic violin solo. 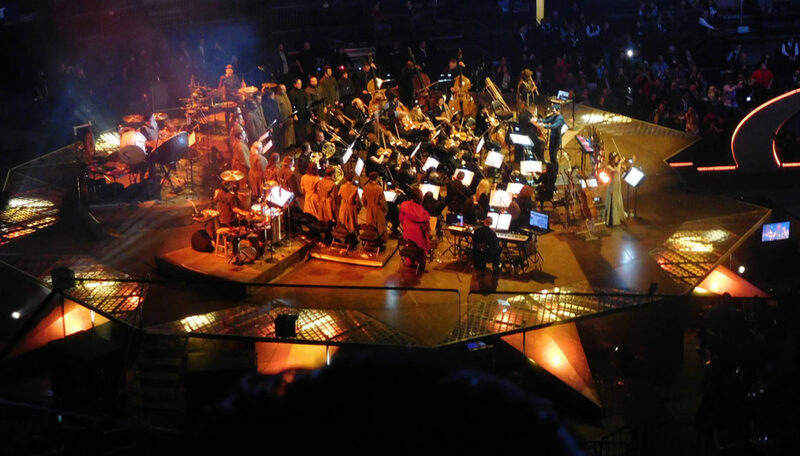 The soloist was one of Djawadi’s own musicians that he had brought along on this tour. Next to her, he brought a singer, a cellist, a keyboard player, a guy who played all kinds of woodwinds and other flutes, and three percussionists. The violinist played a very beautiful solo in the small circle to the right. She was standing inside of a holographic tree where red leaves were falling, giving her solo even more grace. Next up was the cello player who was stomping on a platform filled with water, while music was playing of what I think was the “White Walkers’ Theme”, but I am not sure. It was followed by the music from the scene in which Theon yells “What is dead may never die”. The next piece was music from the end of season one, focusing on Daenerys. It started with sadness on the screens but ended with a very powerful finale showing a strong Daenerys. The music was very well played by the band, the local orchestra, and the choir. When this track was done, it was time to highlight another woman: Melisandre. She has received some booing from the audience. The next piece showed the awesome production value of the show while the music was being performed: it showed a battle on the water with a lot of green fire. The whole stage became the same color, giving the scene even more impact. It was time for the singer to play a huge role in the next piece: she was allowed to sing the great “The Rains of Castamere”. She did it very well and the finale where she sang together with the choir gave me goosebumps. A logical follow-up to this song was, of course, the famous “Red Wedding” scene from the show. The images were gruesome as expected and as I was watching the screens in horror, I did not even pay much attention to the music. The next piece was the opposite, the main attraction was the woodwind player doing all kinds of crazy things on stage. He had an instrument he blew on with some kind of rubber tube that he was waving like mad while also dancing. He even blew on a huge alpine horn in the middle of the stage. This happened while the screens showed the battle on the Wall from the show. Afterwards, music from the relationship of Jon Snow and Ygritte was played. The scene on the screen introduced the next piece of music. When Daenerys yelled “Dracarys!” on screen, the orchestra started playing the piece with the same name. It was great and would be nearly impossible to top by other cues. That was until the choir stood up and sang the first notes of the next piece. Sounds of excitement came from the audience and random people started to shout “Mhysa!” and it was beautiful. Just as when I heard it in Poland, I had goosebumps all over my body and tears started to roll down my cheeks. Luckily, I was able to recover a bit in the intermission that followed this emotional climax to the first half. The second half started with a small teaser for the seventh season of the show, with the orchestra playing music from the Lannister family. After giving the Lannisters some screen and music time, it was time to give the Stark family some love on the screen as well as music-wise. It resulted in a lot of cheering in the audience. When it was done, Djawadi left his conductor post, walked to the middle of the stage and started to play “Needle” on a hammered dulcimer: a horizontal string instrument that is played by little hammers. The next couple of tracks were beautiful examples of how the live music was able to support the scenes that were presented on the screens. One was with Cersei and the High Sparrow, another was a very powerful piece where Daenerys is finding out that her small dragons are not that small anymore. It was followed up by another dragon scene, in which the dragons spat fire. Real fire was used on stage to ensure an even more dramatic effect. Things did not stop there, we saw a lot of death and war on the screens involving the Stark family, ending with the famous “Hold the door” and “Battle of the Bastards” scenes. We could recuperate with a nice duet of the violin and the cello while the screen showed a nice construction of light beams that was also replicated on stage with special lenses. Next, it was time for another highlight. I had heard this piece on Djawadi’s Facebook page during a rehearsal session and I was in love right away. “Light of the Seven” is a beautiful piece where Djawadi played the synthesizer himself. It was even more powerful with the scene for which the piece was written on the screens. After saying thanks, Djawadi conducted the last piece with the orchestra and choir for the night: the Stark finale of the sixth season of the show. Luckily Djawadi and his band had an encore in mind: they played a nice version of “The Bear and the Maiden Fair”. Djawadi played the guitar with a huge smile on his face. After almost two hours the show came to an end. I loved every minute of it; especially because you could see that the production value was very high. The show was perfect for Game of Thrones fans and even we as film music lovers had a great time. As a matter of fact, the audience was a nice mix of TV show lovers and film music fans. I hope some of the TV enthusiasts are now encouraged to listen to more film music in the future because of this great experience. There were still some minor annoyances of course: I really missed a printed program with information. I have no idea who the members of the band were. I recognized one percussionist though. I have seen him before at concerts of Hans Zimmer. I would also really have liked to know who the local orchestra and choir were as they deserve some credit. Also, two sections of a screen broke down just before the intermission, but the crew was right on it when the intermission started and it was easily solved. But also the setup of the screens itself was not perfect: if you had a high seat in the audience like we did, you could not see the middle section of some of the screens because it was obscured by the screen panel above. So the big question is of course: was it worth the trip? For me personally, the answer is simple: the tracks “Mysha” and “Light of the Seven” alone were worth it, the rest was all bonus. I really hope they will take this show to Europe, so more people can experience it. The special stage, although a very nice addition, is not even needed: just play the music with a local orchestra and band on stage with a screen behind them – it will work very well. If you still have the chance: go see it! A program was not provided. Also, guessing the tracks would be a misrepresentation of the show.